Back by popular demand! 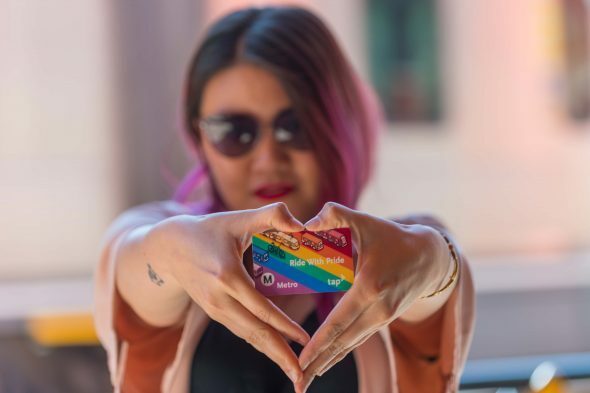 Metro will be stocking TAP vending machines at select stations this Friday with the limited edition Pride TAP cards, so you can Ride with Pride during LA Pride Week. Sunday, June 11! Metro will be hosting a pop-up shop on June 11 outside of Division 7, located at the intersection of San Vicente and Santa Monica Boulevard. The pop-up shop will have Pride TAP cards pre-loaded with $1.75 for sale, as well as limited edition Ride with Pride T-shirts, tank tops, and tote bags available for purchase. Hours are 8 a.m. to 2 p.m. or until supplies run out, so make sure to swing by early! Metro Board Members Mike Bonin, Sheila Kuehl and Robert Garcia show their pride. Metro Board Member Ara Narjarian grabs a Pride TAP card. We’ll also have more details soon about bus detours and transit service to LA Pride Festival events, please stay tuned. Really wish that Metro would have given Foothill Gold Line Stations some of these awesome pride TAP cards. It is a sham that it wasn’t implemented. Isn’t Memorial Park on the Gold Line? Memorial Park is at most 10 stops from the end of the Foothill Gold Line! Such a tough trip to make! What time will the TAP cards be in the TAP machines? They will be stocked overnight and will be available first thing in the morning. I was at Union Station at 06:00 this morning and none of the machines had them: I checked every single one! And I asked the Customer Service counter as soon as they opened. They told me they knew nothing about these cards and did not expect to be selling them. How disappointing! Evidently, Metro thinks an amusing way to celebrate Pride is to mislead its thousands of gay customers and make them waste their time and money and energy. This is pretty much a disaster, Metro. Sorry for today’s confusion, I’ve checked with TAP staff and all listed stations have been stocked at this time. Hopefully you are able to pick one up. Updated info: I went back around 10:00 and there were still none in the TVMs but the Customer Service at Union Station had about 15 cards. Yeay! I’m happy I got one but it is clear that Metro needs to plan these launches better. After the fast sell-out in Long Beach recently, there has obviously been high interest in this card, but there was remarkably bad communication between the people actually stocking the machines, the customer service staff, and The Source, where poor Ms. Chen became the brunt of our complaints because we had nobody else to tell who seemed to know about this card at all! I’m glad Metro has started to announce its special TAP designs and I hope this will be a wakeup call to coordinate the communication better. I’m glad Metro is selling these. However, what does it mean when these are only provided automatically at selected locations? Is there a part of Los Angeles that doesn’t have LGBT people? Is my identity so offensive that Metro can’t risk other constituents accidentally getting a rainbow card? Due to the limited number of cards available, we were only able to stock them at select stations. I have not asked the reasoning as to why these particular stations were selected — 5 of the 8 are terminals and/or major transit hubs, I can ask about the other 3. I appreciate that you’re looking into it, but I wanna ensure you’re asking the right questions. In particular, if TAP card demand is predictable in advance, then supplying every station with enough for a week or two would be encompassed by Metro’s regular operations and maintenance budget. Somebody has already made the decision to ration these cards well below seasonal demand. With the t-shirts and merchandise, and the multiple staff members scheduled to attend, the undersupply appears to have been a policy decision, not an oversight. If this effort has been tailored to maximize visibility in the LGBT community while reaching as few heterosexuals as possible, is Metro really proud of us? I’ve checked all machines at Union Station and Memorial Park as of 5 PM 5/31/17. I even asked the Customer Service desk at Union Station. There are NO “Ride with Pride” cards available. Why is there a delay? Also what is Metro’s plan? Does the community get a real nice isolated machine stocked with cards whenever y’all you feel like getting to us? Will all machines be stocked or just one at each location? They will be available first thing in the morning on June 2. Today is June 1. The machines stocked with the limited edition card will have stickers above the screen that indicate this. There are no stickers above the TVM’s at North Hollywood. How do we know which one it is? I’ve checked with TAP staff and the TVM is stocked and has been marked with sticker. I came down to 7th St/Metro Center first thing this morning. I checked 3 different entrances and didn’t see any machines with the sticker. This is disappointing. As many have commented above, I could not find the TAP cards this morning either. I checked the 4 machines at Union Station Gold Line, and Wilshire/Western. I only saw the stickers for “hard at work” at Union and AARP at Wilshire/Western. We should be able to order these online. Definitely we should be able to order online. That would be great! It would save this repeated Easter egg hunt across town every time. The cards were not available “first thing in the morning” today, even at Union Station. Frustrating that regular commuters could not purchase one. Poor execution of a good idea. Sorry for today’s confusion, I’ve checked with TAP staff and all listed stations have been stocked at this time. This isn’t confusion, this is you Anna, providing the wrong information! Whether the TAP staff gave you the wrong information-stocking the machines overnight or you were confused when the TAP staff was going to stock the cards, it is proving readers the wrong information! Nothing at the north Hollywood station yet. Any idea of when they might get out in? TAP staff has confirmed North Hollywood has been stocked as of 2pm. Dang. Would’ve been great to purchase this online (since I live in NorCal). It’s 1pm and none of the machines at 7th/Metro or Union Station have them. I was able to get some at the customer service center at Union Station though! Oh, lucky you! I wonder if they’ll have any more when I stop by after work. Which part of Union Station is the customer service center? Sorry for today’s confusion! I’ve been informed all listed stations are definitely stocked with cards at this time, stickers showing which machines have the cards. The customer center at Union Station is located on the east end near Patsaouras Plaza. Hope this helps. Thank you. I’ll try to find them after work. Should I also be able to find them at the TVM off the gold line entrance? Unfortunately I’m not sure…I was told it’s TVM #71 at Union Station, but I don’t know the location. 🙁 My instinct is that it’s in the subway mezzanine since I was told they’re stocked at the most highly used machine at each station. Thanks for the updates, Anna. I was able to find the cards at the Wilshire/Western station around 6pm. No Passes at Santa Monica Sta, 12pm. Three customer service folks in blue shirts said they’ll be in the TVM’s by 3pm. We’ll see! The cards have been stocked and should be available, hope you are able to get one. Turns out not much of this post was true. You’ve wasted a lot of people’s time and money today. Was that Metro’s goal? Is that how Metro is celebrating Pride week? By misleading its gay riders? I’m very sorry for the confusion today. This was the information I was given and I have been in touch with TAP staff throughout the day to try and get some clarification on what’s happening. At this time I have been told all listed stations have been stocked, and stickers are in place to show which machines have the limited edition cards. I apologize again for the inconvenience and hope you’re able to get a card if you still want one. Someone needs to do a better job of communicating with the actual stations. I went to 3 different stations, and none of them had them, there were no stickers above any TVMs, and Customer Service had no idea. They finally got some at Vermont/Wilshire around 11 am. This is not the first time this has happened, so perhaps there needs to be better roll out altogether. This shouldn’t be that difficult of a task to get taken care of. How much will the shirts be at the pop up? Last I heard (on Friday, June 2) each shirt will be $25. Now make sure the stickers are removed from the TAP machines once the cards are sold out!! It happened to me with the Expo Line to Santa Monica TAP cards. They had a sticker but the cards were sold out! I just got the standard blue with a couple shapes TAP card!